When school is out, science is in! 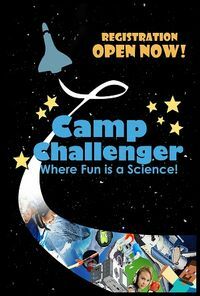 Led by experienced educators, Camp Challenger campers will get to blast off to space, build and program robots, make movies, explore the sciences, investigate coding through Minecraft and much more! Our STEAM-themed camps feature hands-on activities led by experienced educators. The Challenger Learning Center’s “Camp Challenger” strives to ensure campers have fun in a safe and educational atmosphere. All camps include lunch.